In Windsor-Essex County we like to think of ourselves as one region but no matter how you look it, we aren’t, in fact it is much more complicated than the simplistic city vs county narrative that is often shared. 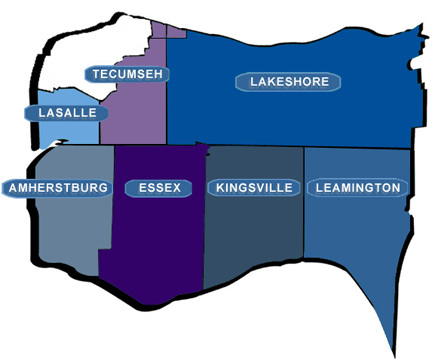 Statistics Canada defines our region as 1 County; 8 Census divisions and municipalities; 1 CMA (consisting of Windsor, Tecumseh, Lakeshore, LaSalle and Amherstburg); 1 CA (Leamington and Kingsville); 1 Health Unit Region; and a part of 1 larger Economic Region (Windsor-Essex, Chatham-Kent and Sarnia-Lambton). Geographically, our region is split between urban, suburban and rural communities, each have their own problems and present obstacles moving forward. So to think of our region as singular unit or eight units each present their own challenges. Although a recent study released by the Fraser Institute illustrated that there were few cost savings through amalgamation, my principle takeaway of that report was that the failure was one of process, not the amalgamation itself. Although a single jurisdiction is too few to recognize the distinct character and challenges that face in Windsor-Essex County, the other extreme finds 8 communities diluting issues resulting in competing political interests overriding sound policy or broader social need. What is needed is something in the middle and for that, the definitions and boundaries of our region need to change! Map of Windsor-Essex County from Stats Canada. Our region has been made up of 8 municipalities since 1990s and it hasn’t brought us overwhelming prosperity. Changing the map won’t bring us immediate wealth or well being bringing our region together in a more productive and interconnected manner doesn’t hurt. Given the prospect of the breaking up of the WindsorEssex Economic Development Corporation will likely lead to a disastrous devolution in our region spawning new schism between the city and county as they create their own economic development agency to compete with Windsor in a time when we should be looking to bring our region together. Many of the challenges that Windsor faces are roots in regional divides: economic development, an aging population and health care, regional transport; urban sprawl, poverty and income inequality. Part of the solution could come from redrawing the map of our region over the next 20 years. First we have Windsor, the urban and economic hub that is the centre of our region. Surrounding Windsor are the bedroom communities of Tecumseh and LaSalle, which are largely made up of subdivisions of family homes and the commercial service industries that support them. For many in LaSalle or Tecumseh, their day starts in the with waking up, getting into their car and driving on the bumpy roads into Windsor for their daily toils. Part of the reason the City’s road network is crumbling is due to residents in Tecumseh and LaSalle working and playing in Windsor on a daily basis, yet not directly contributing to their upkeep. Given that there is largely no geographic separation between the communities and that Tecumseh and LaSalle actually surround Windsor geographically creating a theoretical cap on Windsor’s area and growth, why not make them a single jurisdiction and encourage them to grow inward, rather than exacerbate sprawl into some of the most productive farmland in the country. Of course this leaves 5 other municipalities. Lakeshore, although sparely populated is the largest geographic area in our region and likely needs to be subdivided and merged. Emeryville and Belle River should likely be rolled into the newly amalgamated Windsor with an EC Row extension being a simple way to bring them into the fold and to connect them to Windsor proper. The eastern edge of Lakeshore and Leamington should probably be realigned based on where the populations are with Chatham-Kent and Tilbury. A suggested new boundary could run from Lake St. Clair down Rochester Townline, East down County Road 8, North on County Road 1 before terminating down Campbell Road at Highway 3 on the shore of Lake Erie. 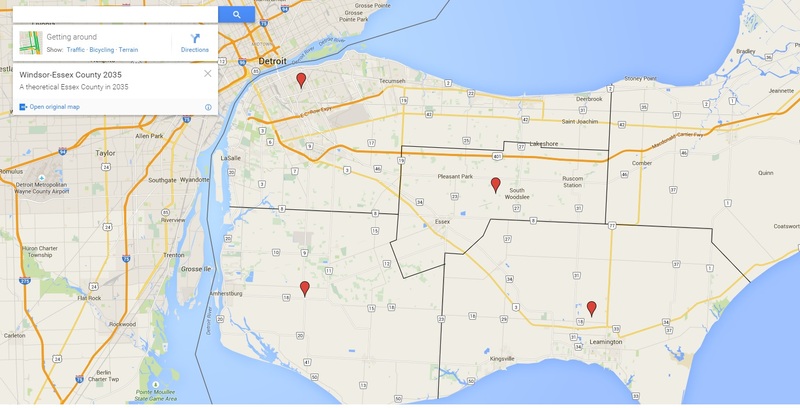 What this has created is a larger population centre on the north shore of Lake Erie, that could bring Wheatley, Leamington and Kingsville together as a singular census unit, forming a South Essex Census Metrolpolitan Area. This change in designation is important as CMAs are the subject of additional studies by Statistics Canada providing our region vital demographic, economic and health based data. The creation of a larger community in South Essex will not only help drive the southern half of the county’s economy but give them the political heft to get provincial support. The proximity of the three communities could allow for the better sharing of resources and create a hub for economic activity on the north shore of Lake Erie. It is that same shore, which is one of the primary lures for retirees to our region, that will enable a combined Leamington/Kingsville/Wheatley to better develop to attract these individuals and develop their communities. This leaves the remainder of Essex County. Lakeshore west of Rochester Townline centred on South Woodslee; Essex proper and Harrow fill the centre of the region and Amherstburg making up the Western edge of county. Whether these “leftovers” should merge together or remain separate municipalities but the map I have provide takes a two municipality approach. Regardless of the affiliation of this sparely populated and large geographic region would still need to combined resources and in many ways be encouraged to pursue partnerships with the larger neighbours where feasibility. A theoretical map of our region in 2035. This outcome is of course a long shot but Windsor isn’t powerless to act. In face of resistance, the City should consider adopting carrot and stick approach with its neighbours. Frankly, Windsor is home to many of the services that people in the rest of the region enjoy and rely on. There is no reason why there shouldn’t be fees to use the roads, sewers and community services that are engage by “out-of-towners”. An obvious choice being being road pricing for those entering Windsor on a daily basis. A CD Howe report on road pricing provides a number of insights on this revenue tool and by making life slightly more expensive for “out of towners” you can curb their behaviour. Even smaller charges, like higher fees for library cards for non-city residents or less ice time for out of town hockey teams at city arenas would over time not only provide new revenue sources for Windsor but also force the electorate of the neighbouring communities to consider amalgamation as a means to bypass the fees. Click here for the zoomable version of the map. Such a system change to our region would require a dramatic shift in mindset. Short of being mandated by the province (as it was and largely failed in the 1990s) amalgemation in our region should be apart of a long term process of greater cooperation. The discussion of Amherstburg sharing police services with Windsor is a prime example of what more could be done. Fire services, road repair, snow removal, tax collection and administration, libraries, community centres, hospital and clinics and schools could and should all be reevaluated, streamlined and improved upon and at the same time blurring the boundaries within our region to the point that they disappear. Over the next 20 year the City of Windsor should lobby hard both neighbouring communities as well as the province towards amalgamation of services and communities. Of course there will be push back from the surrounding communities but Windsor does have size and economies of scale to its advantage. It is unlikely that any community in Windsor-Essex County is going to find a financial panacea that triggers thousands of jobs and bountiful new tax revenue. As a result over the next 20 years we will likely continue to struggle with financing the services that taxpayers desire while keep taxes at reasonable levels which means consolidation of services and government is a real and practical option.